SKIMspiration Europe 2018 will take place in our SKIM headquarter office, which is located on the 6th floor in the Groot Handelsgebouw in Rotterdam. We recommend using public transport to find your way to SKIMspiration, since the Groot Handelsgebouw is located next to Rotterdam Centraal station. Click here to find our office in Google Map or click here for a route description to and inside the building. 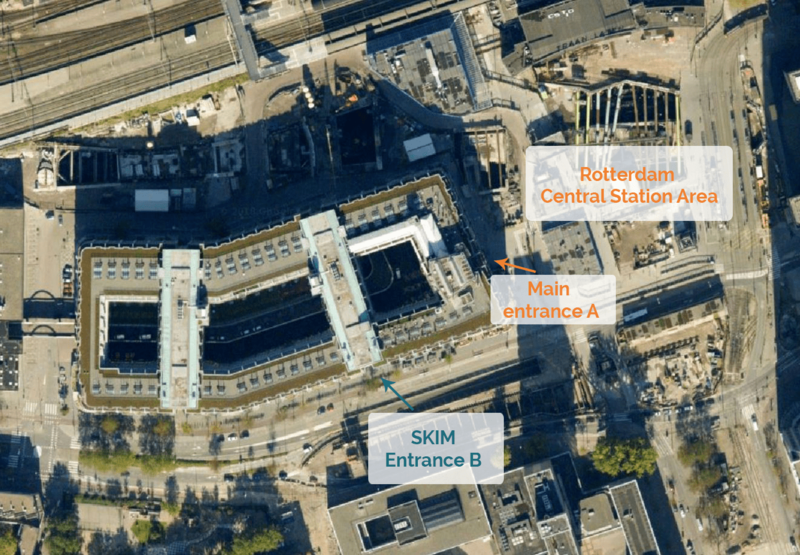 On arrival at Rotterdam Centraal, follow signs for the main exit (“Centrum”). As you exit the station, on your right side you see a large building: the “Groot Handelsgebouw”. Walk straight past the main-entrance (entrance A). On the left of the main entrance, you see a restaurant (“Engels”). Walk past it and around the corner, turning right. This is the “Weena” side of the building. Enter the building at entrance B. Take the elevator to floors 5 and 6. Leaving the elevator go up one flight of stairs – we’re at the right-hand side on the 6th floor. Follow the E19 / A16 to Rotterdam. After the “Van Brienenoordbrug (bridge)”, take exit number 25 (Rotterdam Centrum). You are driving alongside the river on the “Maasboulevard / Boompjes”. Turn right at “Vasteland” (direction “Centrum”). On the corner on your right you find the Golden Tulip Hotel Intel. Go straight ahead until you arrive at a roundabout with a fountain in the middle. Turn left on the roundabout (3rd exit). You are now on the street called “Weena”. Go straight ahead (but keep to the left side of the road) and go through a tunnel. The 1st street on your right is the Conrad Street. On your right you can enter the parking garage of the “Groothandelsgebouw” underneath the building. Enter via entrance B (“Weena” side of the building – best is to enter entrance B in the parking garage). Our office is on the 6th floor; leaving the elevator on level 5/6 and take a small staircase up, the office is directly on your right. Follow the A20 to Rotterdam (ring Rotterdam Noord). Follow signs “Centrum”, until you arrive at a roundabout with a fountain in the middle. Go right on the roundabout. You are now on the street called “Weena”. Go straight ahead (but keep to the left side of the road) and go through a tunnel. Follow the A13 to Rotterdam Noord.